posted by Howard B. Owens in St. Anthony's, City Church, batavia, news, Christmas. City Church hosted its annual community Christmas party at St. Anthony's on Liberty Street, Batavia, last night, and gave away 33 bikes to children from the neighborhood. They also handed out a ton of toys. Numerous people donated bikes, toys, and money to the event, said Ryan Macdonald. posted by Mike Pettinella in news, Batavia City Council, City Church, dwyer stadium. City Councilwoman Rose Mary Christian says the City needs to get tough with landlords and homeowners when disturbances that put employees in jeopardy arise, but just how to proceed can be complicated. That was the gist of a discussion among council members, a city attorney and the police chief at Monday night’s Conference Meeting at City Hall. “I’m tired of policeman getting hurt and firemen being threatened,” Christian said, referring to several incidences in recent months where police have had to be called. She also called for harsher local ordinances that deal with grass mowing, trash, home maintenance and vehicle storage – even outlining a plan that would start with a warning, escalate to a $500 fine and court appearance, and ultimately putting the matter into a judge’s hands. It isn’t as simple as that, however, said Council President Eugene Jankowski. Attorney David Fitch, filling in for George Van Nest, said he felt the discussion “was conflating some different things” since code violations are handled differently than criminal violations. Chief Shawn Heubusch mentioned a program where landlords can check into the backgrounds of potential tenants and also get a description of what took place at the property. Jankowski noted the many delays in processing violations, but Christian said it goes beyond that. “If there are drugs (involved), we can take possession of property. If the landlord is aware of possession of drugs or dealing, they can bring the landlord to court,” she said. Jankowski said that landlords can evict tenants when a crime is committed in their house, while Heubusch said cooperation from neighbors is a key component in cleaning up illegal activity. -- Lead agency status in the State Environmental Quality Review determination and subsequent zoning change ordinance for parcels comprising the St. Anthony’s Church campus on Liberty Street and Central Avenue. The zoning designation, stemming from a request from City Church (owners of the property), will be changed from R-3 Residential to C-3 Commercial to allow for business activities, including a proposal to move the Batavia Youth Bureau there. “These are the final steps of the zoning change,” said Matt Worth, director of public works, who oversaw the issue while serving as interim city manager. -- A local law to amend the City’s municipal code to make Thorpe Street a one-way street for southbound traffic only between Watson and Maple streets. During a brief public hearing last night, Watson Street resident Ken Wolter said he hoped that the change works and asked Council to consider making Watson Street off of Evans Street one-way as well. -- The extension of one-year – through Dec. 31, 2019 – three agreements with Genesee County concerning water supply, operation and maintenance, and facilities lease while leaders work on a longer-term contract in conjunction with a long-term sales tax agreement. Worth said the extensions contain “minimal changes,” most notably the county charging the city an additional 60 cents per 1,000 gallons – up from the current 60 cents per 1,000-gallon surcharge – to help fund capital projects to increase the water supply. Also, as far as the lease of the city’s water plant to the county is concerned, the new agreement would transfer it to the county once the plant is no longer being used. “By doing this, it would not be a liability to the city in the future,” Worth said. He also said he plans to talk to county officials about including a lead services clause in the water supply agreement. -- Acceptance of a New York State Education Department grant for $10,000 and a State Aid Recreation Program grant for $1,000 to assist with the start-up of the Teen City project, a joint venture of the United Way of Genesee County, Genesee County YMCA, City of Batavia and City Church. -- The transfer of $585,000 in unallocated funds to several restricted funds per recommendation of the City Audit Committee. “Funding reserves now for future liabilities, equipment, infrastructure and facility improvements has been, and will continue to be, critical in avoiding larger tax burdens in future years,” Lisa Neary, deputy director of Finance, wrote in a memo dated Nov. 21. The resolution calls for reserve funds to be increased as follows: $150,000 to DPW; $25,000 to Sidewalk; $75,000 to Administrative Equipment; $5,000 to Police Equipment; $40,000 to Fire Equipment; $10,000 to Dwyer Stadium; $50,000 to Facility; $80,000 to Compensated Absence; $50,000 to Workers Compensation; $75,000 to Retirement; and $25,000 to Parking Lot. -- A new three-year lease (through April 1, 2022) with the New York-Penn League for the use of Dwyer Stadium for the league-owned Batavia Muckdogs. The proposed lease is consistent with the most recent lease and calls for a $25,000 capital investment by the City into the facility annually, said Worth, who noted that league officials have yet to respond to the City’s draft of the lease. Worth said the league paid for field and clubhouse improvements last season and continues to pay all utilities. He said that $80,000 is in the current Dwyer Stadium reserve fund. posted by Howard B. Owens in City Church, batavia, news, thanksgiving. Linda Stoiber and Peggy had plenty of pie to give out to guests of City Church this morning at the Generations Center on Center Street, Batavia, as part of the church's annual Thanksgiving Day feast for community members. More than 250 people attended today's meal. Below, Dennis Stoiber serves up some turkey. posted by Mike Pettinella in news, Batavia City Council, City Church. A proposal to rezone several parcels on the City’s Southside moved a bit closer to reality tonight by virtue of a public hearing during City Council’s Business Meeting at the City Hall Council Board Room. City resident John Roach was the lone speaker during the public hearing and he offered a wholehearted endorsement of the plan to change the zoning from R-3 Residential to C-3 Commercial. City Church leaders have asked the City to amend the zoning as they hope to develop commercial activities such as a dance school, art school and community education classes at the site, which incorporates six parcels on Liberty Street and Central Avenue. In addition, church officials are in negotiations with the City to move the Batavia Youth Bureau from its current MacArthur Drive location to the St. Anthony’s campus for an afterschool venture to be called Teen City. Roach urged council members to approve the proposal. Council President Eugene Jankowski noted that no one has spoken against the plan. “So we had the public hearing today and there was only a positive comment – there were no negative comments,” he said. “City Council will weigh that towards the actual resolution to make the amendment to the zoning, and that will take place within probably the next business meeting, depending on other pieces of the puzzle that come together. Council's next session is a Conference Meeting on Nov. 26, but there is a possibility that a Special Business Meeting could be called to vote on the rezoning issue. -- Scheduled a public hearing for 7 p.m. Nov. 26 to amend the City Code to make Thorpe Street a one-way street to alleviate traffic congestion and safety concerns. The proposed amendment calls for southbound traffic only on Thorpe between Watson and Maple streets. In conjunction with the one-way idea, it has been recommended to allow parking on the west side of Thorpe Street between Watson and Maple and to leave the portion of Thorpe Street north of Watson as a two-way street with a stop sign and a parking ban on both sides. -- Amended the police department budget to reflect the receipt of a pair of grants – the first being a $13,000 award from Sen. Michael Ranzenhofer’s office to offset the cost of body cameras for police officers and the second being an $11,374 award from the state Governor’s Traffic Safety Committee for extra patrols to enforce seat belt usage and address speeding issues, specifically in the downtown corridor. City Council authorized funds for a temporary fix of the roof this winter, with plans to fully repair the roof in the spring. Jankowski mentioned that a doctor tenant in the mall was under the impression -- based on an inaccurate report in the local print newspaper -- that Council was not going to fix the roof and, consequently, has started a petition campaign. “(Starting a petition) is a waste of time,” Jankowski said, assuring all those present that the City intends to make permanent repairs to the leaky roof. -- Passed a resolution to serve as the lead agency to conduct an environmental review of a project to construct water and storm drainage improvements on Brooklyn Avenue and within Williams Park. -- Approved requests to hold Christmas in the City and Parade from 2 to 7 p.m. Dec. 1, with the parade from Jefferson Avenue to Summit Street scheduled for 6 p.m., and for a Women’s March and Rally from Jackson Square to the City Centre concourse at 10 a.m. Jan. 19. -- Appointed Kathryn Fitzpatrick to the Youth Board for a term extending to Aug. 31.
posted by Mike Pettinella in news, Batavia City Council, genesee county, City Church. City of Batavia leaders believe they have come up with one way to address the traffic safety concerns on the Southside streets of Watson, Thorpe and Maple: Turn Thorpe Street into a one-way street. Police Chief Shawn Heubusch, in coordination with Director of Public Works Matt Worth and Maintenance Superintendent Ray Tourt, asked City Council to approve a recommendation to allow motorists to travel southbound only on Thorpe Street between Watson and Maple. Council, during tonight’s Conference Meeting (a Special Business meeting followed), decided to move the suggestion forward to its next Business Meeting on Nov. 13. If the board votes in favor of the modification, a public hearing on a change in the municipal code would be scheduled. Over the past year or so, residents of those streets have petitioned City Council to do something about cars not stopping at the Thorpe/Watson intersection, which already is hampered by limited sight lines. Residents had asked for the placement of a stop sign on Watson Street headed eastbound at the intersection of Thorpe Street. Heubusch said that a traffic study did not warrant a stop sign or other traffic control device, plus there wasn’t enough space to properly erect a stop sign. “So in order to alleviate that issue, we suggested creating a one-way street – making Thorpe a one-way street,” he said. “It is a southbound street only now (per the recommendation), coming from Watson to Maple. City officials also are recommending that parking be allowed on the west side of Thorpe Street between Watson and Maple, and leaving the portion of Thorpe Street north of Watson as a two-way street with a stop sign and a parking ban on both sides. Heubusch said that if these changes don’t work, they will explore other options. -- Voted to approve an amended sales tax agreement with Genesee County that extends the current pact for one more year, through Dec. 31, 2019. As it stands now, the City receives 16 percent of the sales tax revenue, compared to the county’s 50 percent and the towns sharing the remaining 34 percent. A new 40-year agreement which changes the terms is on hold due to objections by the State Comptroller’s Office, which is calling for “special legislation” by the State Legislature to vote on the contract. -- Voted to schedule a public hearing at 7 p.m. Nov. 13 on an ordinance to amend the zoning map of the City of Batavia per a request by City Church to change parcels at the former St. Anthony’s School/Church campus from R-3 Resident to C-3 Commercial. As reported previously, City Church leaders are hoping to offer commercial activities such as a dance school, art school and community education classes at the site and they have been working with the City to house the Batavia Youth Bureau, with the idea of renaming it Teen City. Council also agreed to taking on lead agency designation in a mandated State Environmental Quality Review of the six parcels on Liberty Street and Central Avenue. -- Voted to reject bids from two companies for the replacement of two areas of flat roofs and four entry silos at the City Centre due to the fact that the bids came in 25 to 30 percent over the estimated cost (about $150,000) of the project. Instead, Council is going with Worth’s recommendation for DPW to perform some remedial work on the roof and silos, and then rebid the work to start in the spring as part of a larger project. -- Accepted a STOP-DWI grant for $4,576 for a detail that starts this month, and voted to amend the City’s personnel policy manual to adopt the state’s sexual harassment policy, which calls for all employees to be trained by Oct. 9, 2019.
posted by Billie Owens in Announcements, addiction, opioid crisis, City Church, recovery, coffee talks, Friends of Recovery NY. If you have a friend or family member struggling with addiction, consider connecting with others in the same situation at a get-together at City Church -- Outback on two upcoming Saturdays. "Coffee Talk" will be held on Nov. 3 and Dec. 8 from 10 to 11:30 a.m. at 210 E. Main St., Downtown Batavia. Both sessions will feature a keynote speaker -- TBA. Join others for a relaxed time of support, encouragement and coffee, of course! Friends of Recovery NY know that: "Addiction can have a devastating impact on the families of those struggling with a substance abuse disorder. In fact, it's been said that addiction is a disease of 1+4 because it affects not only the individual, but at least four other loved ones as well. "Sadly, family members are often at a loss for how to help the individual in active addiction, other members of the family or even themselves. To make matters worse, the shame and stigma society associates with addiction keeps those who need help from reaching out -- even to close friends and family. "Instead, most families struggling with addiction suffer in silence and don't know where to turn." The good news is that there are some wonderful family resources available to help them and other loved ones cope, heal and carry on. 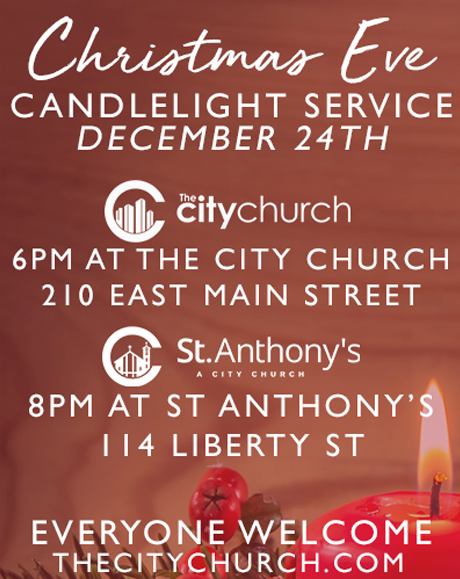 For more information, please call The City Church at 343-6895. Batavia City Council President Eugene Jankowski said he is confident that the Batavia Planning & Development Committee will come up with the best way to rezone parcels of the former St. Anthony’s Church/School campus on Liberty Street and Central Avenue in order to create a much-needed “community benefit” on the City’s south side. Jankowski, speaking after Tuesday night’s City Council meeting, took the planning committee’s recent inability to pass a zoning change from its current R-3 Residential to the requested C-3 Commercial in stride, noting that the planners generally are in favor of it. At a PDC meeting on Sept. 18, the vote was two in favor, one opposed and one abstention, but three votes were needed for passage (one board member was absent). The property was purchased by City Church in 2016, and is hoped to become a destination for commercial ventures such as a dance school, art school and community education classes, as well as the future home of the Batavia Youth Bureau (Teen City). “I hate to go ahead until this is accomplished because I don’t want to talk about something that can’t be a reality until it is approved,” he said, “but we were just over there tonight, and there are 150 kids there right now. A revision to the time period of a new sales tax agreement between the City of Batavia and Genesee County is scheduled to be discussed by the Batavia City Council at a Special Conference Meeting at 7 p.m. Tuesday at the City Hall Council Board Room. In an Oct. 2 memo to City Council, Interim City Manager Matt Worth wrote that the state Comptroller’s office likely would not approve the agreement with its current 40-year term without “special legislation” from the state legislature. “Genesee County, with support from the City, will be requesting through our state representatives, that this special legislation be introduced for approval during the next available session,” Worth wrote, adding that there is precedent for such a move as Wayne and Ontario counties previously secured similar agreements. As a result, Genesee County has offered a 12-month extension agreement – through Dec. 31, 2019 – to provide time for the “special legislation” to go through the legislative process and pave the way for the signing of a 40-year pact, Worth wrote. In September, Worth reported that the City and Genesee County reached a deal giving Batavia 16 percent of the county’s 50 percent share of the 8 percent sales tax through the end of 2018 – with provisions for that amount to grow in future years by a maximum of 2 percent per year. County legislators deemed that a change in the current agreement was necessary due to pending large expenditures, primarily a new county jail and several bridge replacements/repairs. Also on the Conference Meeting agenda is a recommendation from the City Planning & Development Committee concerning a request by City Church to rezone several parcels on Liberty Street and Central Avenue from R-3 Residential to C-3 Central Commercial. According to a letter dated Sept. 19 from Duane President, PDC chairperson, a vote to rezone five Liberty Street parcels and one Central Avenue parcel resulted in two in favor, one opposed and one abstention. Three votes were needed for it to pass, however, and the issue remains on the table. Preston, speaking today by telephone, said his committee now has decided to approach the matter with a focus on creating an alternate zoning district or establishing a new district classification. Preston said the PDC has called upon the city attorney to make changes that would satisfy both residents and the church. City Church purchased the former St. Anthony’s Church campus, which included a sanctuary, school and residence, in 2016. The Rev. Martin Macdonald, pastor, has indicated that the church wishes to offer activities such as a dance school, art school and community education classes that, according to city planners, could be considered a business activity and nonconforming use in an R-3 district. More recently, it was reported that City Church is negotiating with the City to relocate the Batavia Youth Bureau from its current location on MacArthur Drive to the Liberty Street property. The proposal is supported by the United Way of Genesee County and other agencies, and is contingent upon the zoning change. posted by Howard B. Owens in GCEDC, news, St. Anthony's, batavia, City Church. As part its workforce development mission, the Genesee Economic Development Center has been participating in Tuesday evening activities at St. Anthony's, run by City Church, by bringing in recruiters to help connect members of the community with job opportunities. Last night, Remedy Staffing was on hand to let community members know they can help get job seekers interviews with local companies. Chris Suozzi, VP of business development for GCEDC (top photo and playing basketball below), told the people gathered in the gym during a break in the basketball games that there are more than 1,000 jobs available in Genesee County, including jobs that pay $15 an hour or more and jobs that provide a career path for advancement. "Whether you're looking for full-time or part-time work there are jobs you can get started on tomorrow," Suozzi said. Ryan Macdonald, who supervises Tuesday night activities at St. Anthony's, reminded the crowd they asked for help with finding jobs which is why GCEDC and Remedy staffing were on hand. Kathryn Kempisty, client partnership supervisor for Remedy, said it would only take 30 seconds of a person's time on Tuesday night and a 30-minute meeting sometime in the next week in order for Remedy to line up job interviews with local employers. "If you don’t know what you’re looking for, we can let you know about the options," Kempisty said. "There is so much out there that we can’t wait to have you come into our office." Kathryn Kempisty and Brittany Nadrowski, Remedy Staffing. posted by Mike Pettinella in news, Batavia Youth Bureau, Genesee Area Family YMCA, united way of genesee county, City Church. Batavia City Council is prepared to enter into a partnership to develop Teen City, an afterschool program for kids from the ages of 9 to 16 to be housed at the City Church-owned St. Anthony’s campus on Liberty Street. The board, at its Conference meeting tonight at City Centre Council Chambers, reacted positively to a presentation by Jocelyn Sikorski, executive director of the City and Genesee County youth bureaus, by agreeing to let her and Acting City Manager Matt Worth continue their negotiations with City Church to move the City Youth Bureau from its present MacArthur Drive location. Sikorski (in photo above) said St. Anthony’s would offer a classroom/tech room, recreation room, gaming room, cafeteria, kitchen and full gymnasium during program hours, which are set at 2:30 to 6 p.m. from Monday through Friday during the school year and 1 to 6 p.m. during the summer. The youth bureau and YMCA have secured more than $110,000 thus far, she said, with the United Way of Genesee County pledging $50,000 for renovations and start-up and an additional $10,000 annually for five years to maintain the program. Bullet Aid ($30,000), Greater Rochester Health Foundation ($17,600), Ralph Wilson Legacy Funds ($11,000) and Rotary Club of Batavia ($5,000) also are supporting the project, Sikorski said. The plan is contingent upon the facility being rezoned from residential to commercial, a process that has moved along and will be determined by a vote of the City Planning & Development Committee. Other things that need to be done before the program starts include information technology upgrades, renovations in line with Americans with Disabilities Act requirements and a security policy to be “modeled after the Batavia City School District’s,” Sikorski said. City officials have begun to talk about a lease agreement with City Church, but no terms have been reached yet, Worth said. “We haven’t really had that defined yet. We’ve had very front-end conversations on how the structure might be, but the actual financial parts of it have not been nailed down yet to give specific numbers,” Worth said, adding that necessary investments by City Church will weigh into the terms. Worth said that if the City School District opts to use the existing Youth Bureau, leasing terms for that site would be negotiated. Council Member John Canale said his idea would be to "convert it (the current Youth Bureau) back to a pool house and put the (City) pool back in there." Sikorski said the timeline is one “you may call ambitious” as they hope to have Teen City opened by January. -- A resolution to continue stipends above and beyond their normal salaries to Worth, James Ficarella, Ray Tourt and Lisa Neary through the pay period ending Jan. 4. All four have taken on additional duties during the months the City has been without a manager or assistant manager. Worth would continue to be paid a stipend of $1,000 per month, while Ficarella (superintendent of water and wastewater), Tourt (superintendent of maintenance) and Neary (deputy director of finance) would keep getting a $750 stipend. “Since we haven’t had a manager or assistant manager, it really isn’t costing the city taxpayers,” he said. His colleague, Rose Mary Christian, however, looked at the request differently, saying she opposed extending the stipends past October – the month that new manager, Martin Moore, assumes his duties. She was the only one to oppose the extension as the rest of the group agreed that two additional months would be needed to ensure a successful transition. -- Two resolutions dealing with City Fire Department programs – the implementation of an external Emergency Medical Technician class to be offered on an annual basis and the acceptance of a $1,500 state grant to continue a child safety seat initiative. Fire Chief Stefano Napolitano said there about 27 people who wish to take the class, which is designed to train citizens interested in becoming EMTs for their own personal benefit as well as those who offer their services to other fire, rescue or Emergency Medical Service agency. Napolitano requested a budget transfer of $15,000 to deliver the class, and said he expects that tuition fees will return that amount and likely $4,000 more back to the City. -- A resolution to solicit bids to repair the silo entries of the City Centre Mall and segments of the roof near Sunny’s Restaurant and the hallway adjacent to City Hall. The repairs are part of the settlement agreement between the City and Mall Merchants Association. “These two areas (of the roof) are where the vast majority of the proverbial buckets are sitting,” Worth said. posted by Billie Owens in news, Announcements, crossroads house, City Church, Musical Memories. This Saturday, Sept. 22, starting at 6:30 p.m, marks the 10th performance of the Music Memories Concert being held at City Church, located at 210 E. Main St., Batavia. All proceeds for this concert go to support Crossroads House, a comfort care home for the terminally ill, in its 20th year of serving residents of Genesee and Wyoming counties. It’s St. Joe’s Reunion Brass Ensemble’s final performance using its present name as we know the group. Nine years ago, Frank Panepento along with his friends, started the Reunion Brass Ensemble specifically with one purpose in mind: Set up a concert to help raise money for Crossroads House. Well thousands of hours in rehearsal time by hundreds of musicians, thousands of miles/hours have been clocked in by those musicians over the years. There has never been one red cent charged by any of the musicians over that period of time. They even paid for their own ticket to sit and watch the show. They had to perform in other shows to pay back the groups that came and performed at the Crossroads show for free. These performers choose to rearrange their lives to help an organization that they believed in -- CROSSROADS HOUSE -- VOLUNTEERISM at a different level! "I promised my friends, God willing, I would do any and everything I could to pack City Church while ushering in a new era for St. Joe’s Brass Ensemble," Panepento said. Come on out for what promises to be a fantastic show!" Penepinto said. "Bring your family. Bring your friends. Help make this a night for the musicians and all of (us) to remember." Tickets are $5 general admission; $10 reserved. Tickets are available at Crossroads House, Roxy's Music Store, Valle Jewelers, The Prospector Restaurant (Attica). posted by Lisa Ace in Sponsored Post, advertisement, crossroads house, Musical Memories, City Church, music, fundraiser, batavia.